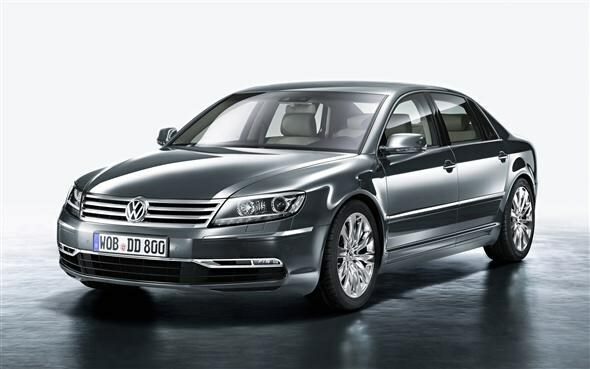 Volkswagen has given the Phaeton luxury saloon a mild facelift and new technologies. The revised model features a new bumper, front wings and bonnet. It also gets LED running lights and new grille design that brings it in line with newer models like the Touareg and Polo. At the rear there's newly designed lights above a redesigned bumper. Revised alloy wheels finish off the exterior changes. Inside, the refreshed Phaeton includes a new steering wheel and colour electronic display along and new trim details. Customers can also opt for Google Maps with cars that have sat-nav. As you'd expect standard equipment is on a high level with eight airbags, 4MOTION all-wheel drive, adjustable air-suspension, leather trim, sat-nav and 18-way adjustable electric seats. The Phaeton range is set to go on sale in August.